LONG ISLAND RAILROAD. Memorandum and Letter Book, 1835-1872. 344 pp., of which 212 pp. have writing, 8¼ x 13 x 1¼ in. This volume, likely originally belonging to chief engineer James P. Kirkwood, contains a wide variety of memoranda relating to the railroad. 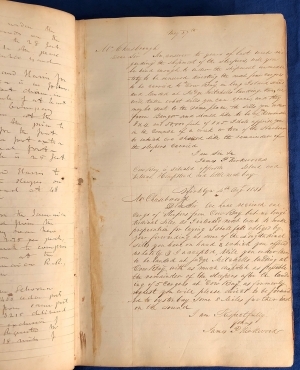 It begins with two pages of diary-like entries from February 8 to May 16, 1836, including mention of Matthias W. Baldwin (1795-1866), the founder of Baldwin Locomotive Works (February 8), and discussion of the route for the new Williamsburg Branch (April 1) and reports on the contractors at Jamaica (May 4 and 11). 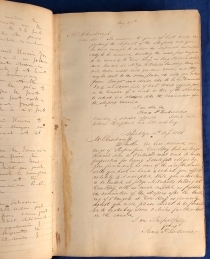 It is followed by copies of two letters from the chief engineer regarding the delivery of railroad ties from Maine, May 27 and August 4, 1836, then six pages of estimates for grade work on new lines between Jericho and Ronkonkoma Pond, between Jamaica and Jericho, and between Flushing and Jericho. Next are three draft letters, totaling 40 pages, to the president and directors of the railroad, reporting engineering details on three different routes which had been surveyed from Jamaica to Greenport. The letters are dated November 4, 1835, January 1836, and September 19, 1836, and include tables estimating the costs for grading each route. 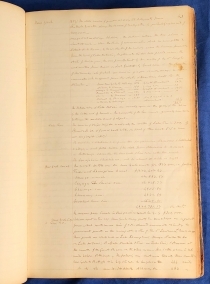 The following 37 pages include copies of letters to and from Long Island Rail Road engineer James P. Kirkwood between August 11, 1835, and March 28, 1837, mostly about surveying and construction issues. Among the interesting letters is one from Postmaster General Amos Kendall to the President of the Long Island Rail Road, April 26, 1836, asking for a map or plan of the route so the post office could update its maps. These pages also include an August 9, 1836 letter from Lieutenant George Gordon Meade (1815-1872), acknowledging payment of $45.44 for “services rendered” to the railroad, likely surveying, shortly before he resigned from the army to pursue work as a civil engineer. Meade went on to lead the Army of the Potomac to victory at the Battle of Gettysburg in July 1863, and continued in command until the end of the Civil War. James Pugh Kirkwood (1807-1877) was born in Edinburgh, Scotland. After his education and an apprenticeship to a land surveyor, he began his own business in Glasgow in 1832. Later that same year, he immigrated to the United States, where he worked as an engineer on the Norwich & Worcester, the Boston & Providence, and the Stonington & Providence Railroads. In 1837, he became the resident engineer for the Long Island Rail Road. From 1840 to 1843, he was resident engineer for the Western Railroad of Massachusetts. Over the course of his career, Kirkwood became one of the foremost civil engineers of the mid-nineteenth century. He was involved in many improvement projects to enhance the harbor of New York City. As general superintendent of the New York & Erie Railroad, he pioneered the use of telegraph signals to manage trains. From 1850 to 1855, he was the chief engineer of the Missouri Pacific Railroad and managed its construction. He was a co-founder of the American Society of Civil Engineers in 1852, and served as its president from 1867 to 1868. He also became involved in a variety of water supply projects for various cities in the United States and Europe. Long Island Rail Road (1835-1928, 1949-present) is the oldest U.S. railroad still operating under its original name and charter. The New York General Assembly passed an act to incorporate the Brooklyn and Jamaica Railroad in 1831, which incorporated in 1832 to build a ten-mile line between those cities. Engineer Major D. B. Douglass planned for a continuation through the center of Long Island to near its eastern end to connect New York and Boston via rail and steamship. The legislature chartered the Long Island Rail Road Company in 1834. The railroad organized in June 1835 with Knowles Taylor as the first president, and it soon acquired the Brooklyn and Jamaica line. The main line from Brooklyn to Greenport was completed in 1844, but rail and steamship service to Boston lasted only until 1847, when competing rail lines through southern Connecticut and steamships directly from New York took away business. The railroad then turned its attention to local service and added more branches to the northern and southern shores, while small rival rail lines opened on the island. In 1875, New York rubber baron Conrad Poppenhusen acquired all of the railroads and consolidated them under the Long Island Railroad Company. By 1900, the Pennsylvania Railroad purchased a controlling interest in the Long Island Railroad, and the railroad served more and more commuters into Manhattan. From 1928 to 1949, the railroad was largely owned by the Pennsylvania Railroad, but it declared bankruptcy in 1949, and the Pennsylvania Railroad stopped supporting its debts. The Long Island Railroad came out of bankruptcy in 1954, and the State of New York purchased it in 1965. Today, the railroad carries more than 300,000 passengers each weekday over more than seven hundred miles of track. Next comes eight pages of descriptions of land purchases, dated between 1798 and 1842, which may be related to the Long Island Rail Road. The latter half of the book was apparently used by at least two different owners who recorded property acquisitions, reports on canals and railroads in different states, and various memoranda. 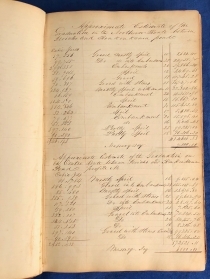 Peter J. Butler used fifty-eight pages in the latter half of the volume for a diary with income and expenditures from January 1870 to March 1872. Later pages record Butler’s individual accounts with John Allen, ? Johnson, Abner Reeves, Charles Bessing, the School District, Nathan Squire, and M. P. Hart. 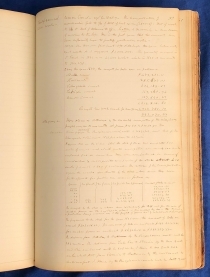 Four additional pages give school receipts and expenditures for school years ending August 31, 1873, and July 31, 1875; Butler served as clerk for the school. The diary provides an interesting view of the household finances of a craftsman and Civil War veteran in the years after the war. Peter J. Butler (1842-1889) was born in New Jersey as the son of Peter Butler (1806-1874) and Catherine Butler (1802-1893), both Irish immigrants. Peter J. Butler was a farmer and hatmaker in Livingston, New Jersey, twenty miles west of New York City. During the Civil War, Butler served as a landsman for the navy steamers USS North Carolina and USS Monticello from August 1864 to June 1865. In February 1867, he married Hettie C. Denman, with whom he had two children. 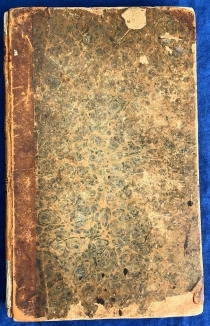 Another owner of the book appears to have been John S. Cunningham, who is likely responsible for the copy of the “Speech of Adherbal to the Roman Senate, imploring their Protection against Jugurtha” in parallel Latin and English columns and a map of a battle from the Jugurthine War in 108 B.C. with Latin labels and narrative. Both have the initials “J.S.C.” at the bottom. Among other items in the book is a brief “List of John S. Cunningham’s private library,” including books on Greek, Latin, and French, and an 1847 account of J. S. Cunningham with Andrew A. Smalley (1814-1893) covering two pages. Early in Butler’s diary is an entry for January 9, 1870: “Wrote to John S Cunningham,” so perhaps Cunningham had given the ledger to Butler. John S. Cunningham (1827-1893) was born in New Jersey and educated at Orange Academy. He particularly studied surveying and civil engineering. He was involved in the manufacture of wrought bar iron for several years. In 1848, he became an assistant engineer with the Morris & Essex Railroad and then the Patterson & Ramapo Railroad. From 1849 to 1851, he worked as an engineer on the Chesapeake and Ohio Canal. He then returned to railroad work through the 1850s. He settled in Coalsmouth, Virginia (St. Albans, West Virginia), thirty-five miles east of Huntington. During the Civil War, he served as an officer in a loyal Virginia regiment, then returned to St. Albans, where he held a variety of local offices, including from 1889, judge of the Kanawha County Court. Overall good. 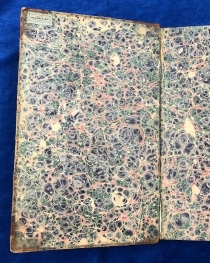 Cover wear and some missing spine cap; marbled endpapers; one torn page; interior clean.